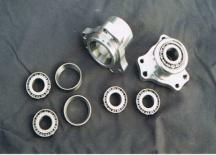 Taper bearings take the side load and roll free through the corners. Wide spacing for better side load on bearings. 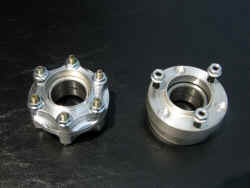 This is a narrow hub designed to fit the Fiser spindle but it will work on any spindle. 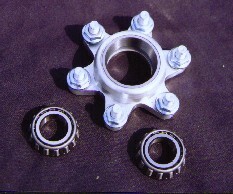 DUAL bearing hub has 2 - 1 1/4" x 1/2" bearings stacked together. Uses 3 - 1/4" studs for mounting rims. Fiser Lightweight hub has 2- 1 1/4" bearings stacked together. 6 bolt design uses 1/4" bolts. Wheel mounts on 3 - 1/4" studs. 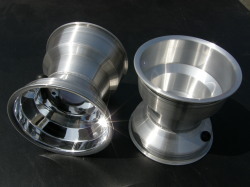 You can replace the Inner Sleeve in an older Smoker Hub with a sleeve that has an internal spline all the way around.